FRANKS, Gary A., a Representative from Connecticut; born in Waterbury, New Haven County, Conn., February 9, 1953; B.A., Yale University, New Haven, Conn., 1975; member of the Waterbury County, Conn., board of aldermen, 1986-1990; unsuccessful candidate for comptroller of Connecticut in 1986; elected as a Republican to the One Hundred Second and to the two succeeding Congresses (January 3, 1991-January 3, 1997); unsuccessful candidate for reelection to the One Hundred Fifth Congress in 1996; unsuccessful candidate for election to the United States Senate in 1998. 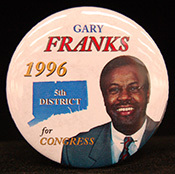 Gary A. Franks in Black Americans in Congress, 1870-2007. Prepared under the direction of the Committee on House Administration by the Office of History & Preservation, U. S. House of Representatives. Washington: Government Printing Office, 2008; Franks, Gary. Searching for the Promised Land: An African Americans Optimistic Odyssey. New York: Regan Books, 1996.